Under the leadership of Drew McClellan and Gavin Heaton, our “tribe” of authors for The Age of Conversation book last year earned $15,000 for Variety, the Children’s Charity using social media fusions of marketing with meaning, collaborative context and solid content, which this year is doubly good. And just like last time, not a penny to be earned by ANY author or editor. Not even a free book or download copy. We’re all in this tribe for the kids. yay! 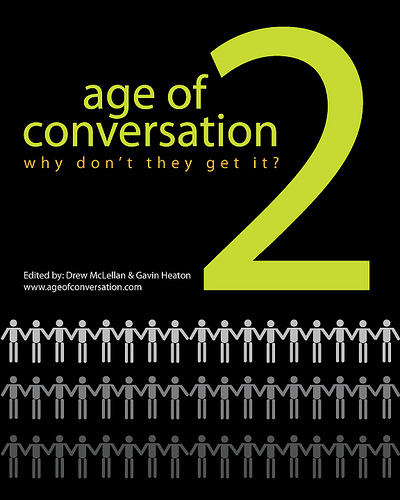 The way that Seth Godin describes the premise of HIS bookTribes is a picture perfect case study of Drew and Gavin’s Age of Conversation book creation…back when it was merely a glimmer of an idea. As Godin blogs, “Tribe management is a whole different way of looking at the world”…describing “permission marketing” that turns strangers into friends and friends into colleagues, customers, or cause-marketers. In the case of OUR nonprofit, Shaping Youth is a tribe of disparate voices from all walks of life, united in one simple common cause…the physical and emotional well-being of children. That means our tribe ranges from kids, teens and youth activists to parents, educators, corporations and nonprofits using the power of media and marketing to achieve a more positive social influence…A healthier worldview. Our Shaping Youth conversation consistently asks “Why don’t people get it” because we just don’t ‘get’ why people think profiteering should trump public health. It’s ALL valid to illustrate that conversations taking place in humanity need to go beyond hawking widgets and selling out childhood pumping vapid values into a fragile ecosystem of impressionable kids. 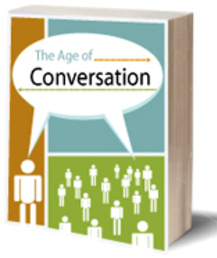 Why is The Age of Conversation so important? It’s just a book, right? Blogs. Chat rooms. Forums. Social networks...all 21st century digital conversations that youth embrace as a ‘given’ when parents may still be at the inquisitive ‘huh?’ stage. Parents must ‘get it’ to preclude any accusation of slippage into the Pleistocene era, for it’s key to open communication and being able to understand your own child! When I talk about youth’s potential to mobilize a digital dialogue in a nanosecond, I’m speaking of the exact same social media phenom that’s transpiring here for our book. Think about it. Drew McClellan and Gavin Heaton had never met each other, lived in opposite parts of the world, and shared a few commonalities that seeded an idea…and in three months time, these agents of change brought a top quality book to market and a fully published probono project to fruition, uniting a cacophony of views and voices into a digital conversation that sparked new thinking among communicators everywhere! So why does “tribal influence” matter? Again…it’s the QUALITY and passions of the tribe that create momentum for sustainable change. Look at Britt Bravo’s growing ‘Changebloggers’ network on ning. Look at the traction of the RezEd.org hub for virtual worlds uniting educators and virtual explorers in a community hub conversation about ethics, benefits, innovation, and youth! Point is, we follow conversations. We act upon them. We trust and believe in those we have formed community with, even among internet strangers (Facebook, Twitter, blogs) that have now become friends. In other words, it’s not about ‘bigger numbers’ anymore. 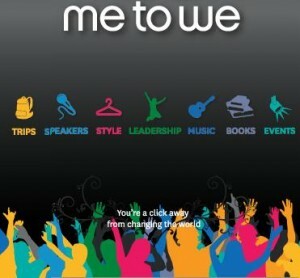 It’s about the value and benefits of the conversation itself…going from “me to we” championing change into a mindshifting movement and social enterprise, much like with Free the Children. Tribal action talks about viral umpf as less important than sustainable staying power, going “beyond public relations and awareness related benefits, measuring the breadth of spread of an idea is not as important as looking at the depth of commitment and interaction of true fans, who end up being the people who recruit most new members.” Yep, that about sums it up! Now, it’s flourishing by bringing out many more of “the good guys” doubling in size and scope, to 237 authors from the U.S. and 15 different countries contributing to this effort…Proof positive that marketing and media can be used to expand, transform, and create new media tribes worth following! 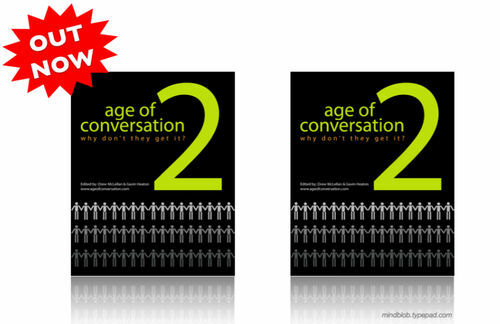 Proud to be a part of The Age of Conversation…You can help Variety, the Childrens Charity buying the hardback, paperback or digital download here, and glean tips from the pros to use in your own life, whether the “tribe” is your family, your work environs, your nonprofit brand, or your neighborhood. Author List For Age of Conversation 2: Why Don’t They Get It? Visual Credits: Lead graphic via fellow AOC2 author and new Facebook friend Luc Debaisieux of MindBlob out of Brussels, Belgium; and thanks to Kirstin Gorsky’s alphabetical author list. Drew & Gavin, our illustrious editors deserve our ongoing wishes, link love, and heartfelt thanks for their tenacity, babysitting, and patient coordination of 237 creative souls. I agree, this is a great year end gift for board members. And with concise, well written chapters, it is easy to dip into when you have a spare moment (let’s put that cognitive surplus to work). Thanks for such a great comment and also what a great blog and site you have! and what do you think abnout ags crisis in Russia? WhereI can to find blogs on this topic? It needs better organization, I’ll grant you, but hard to understand? Nah…that part is pretty clear. Can you elaborate? Oh, it’s true, I know!